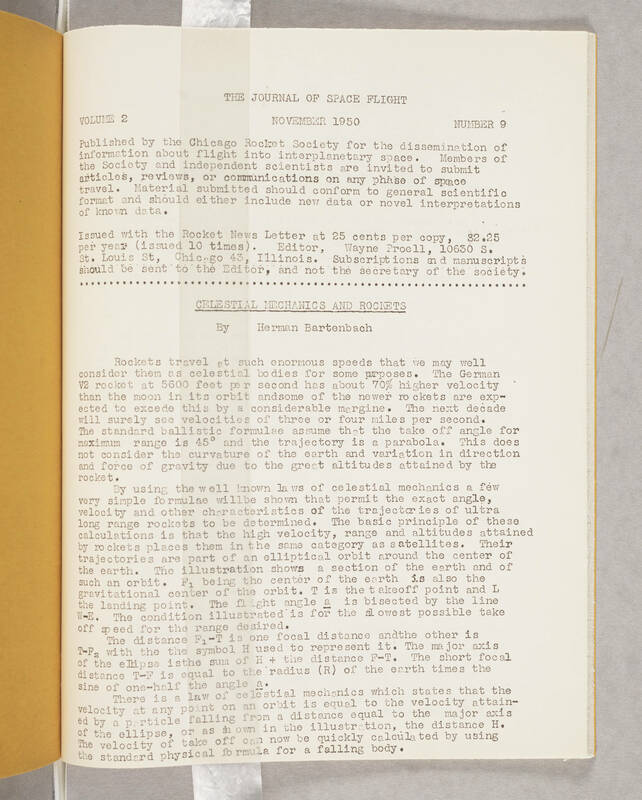 THE JOURNAL OF SPACE FLIGHT NOVEMBER 1950 VOLUME 2 NUMBER 9 Published by the Chicago Rocket Society for the dissemination of information about flight into interplanetary space. Members of the Society and independent scientists are invited to submit articles, reviews, or communications on any phase of space travel. Material submitted should conform to general scientific format and should either include new data or novel interpretations of known data. Issued with Rocket News Letter at 25 cents per copy, $2.25 per year (issued 10 times). Editor, Wayne Proell, 10630 S. St. Louis St., Chicago 43, Illinois. Subscriptions and manuscripts should be sent to the Editor, and not the secretary of the society. CELESTIAL MECHANICS AND ROCKETS By Herman Bartenbach Rockets travel at such enormous speeds that we may well consider them as celestial bodies for some purposes. The German V2 rocket at 5600 feet per second has about 70% higher velocity than the moon in its orbit and some of the newer rockets are expected to exceed this by a considerable margin. The next decade will surely see velocities of three or four miles per second. The standard ballistic formulae assume that the take off angle for maximum range is 45 degrees and the trajectory is a parabola. This does not consider the curvature of the earth and variation in direction and force of gravity due to the great altitudes attained by the rocket. By using the well known laws of celestial mechanics a few very simple formulae will be shown that permit the exact angle, velocity and other characteristics of the trajectories of ultra long range rockets to be determined. The basic principle of these calculations is that the high velocity, range and altitudes attained by rockets places them in the same category as satellites. Their trajectories are part of an elliptical orbit around the center of the earth. The illustration shows a section of the earth and of such an orbit. F1, being the center of the earth is also the gravitational center of the orbit. T is the takeoff point and L is the landing point. The flight angle a is bisected by the line W-E. The condition illustrated is for the slowest possible take off speed for the range desired. The distance F1-T is one focal distance and the other is T-F2 with the symbol H used to represent it. The major axis of the ellipse is the sum of H + the distance F-T. The short focal distance T-F is equal to the radius (R) or the earth times the sine of one-half the angle a. There is a law of celestial mechanics which states that the velocity at any point on an orbit is equal to the velocity attained by a particle falling from a distance equal to the major axis of the ellipse, or as shown in the illustration, the distance H. The velocity of take off can now be quickly calculated by using the standard physical formula for a falling body.